Can you stand more pictures of Spring in Central Illinois? Not sure what these trees are, but I thought they looked pretty against the blue sky. 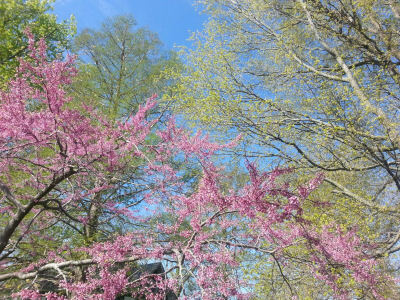 Redbud, an early bloomer, makes a heart-shaped leaf after these delicate flowers fall off. Here’s the progress on the tulip I showed you before (https://domermom.com/2015/04/11/finding-shelter/). Still hasn’t bloomed, grrr! 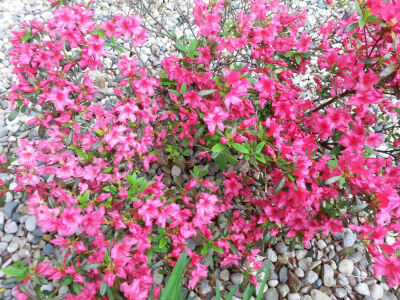 This entry was posted in Seasonal and tagged azalea, dogwood, flowering trees, Japanese maple, redbud, Spring in Central Illinois, tulips. Bookmark the permalink. Thanks, Suzi — I appreciate you’re stopping by to take a peek! Absolutely yes, Debbie! And I love them! 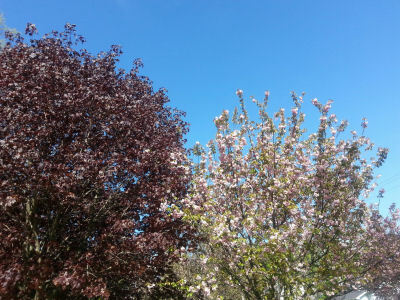 Like you, I’ve been taking so many pictures of spring here in Philly – the flowers, the trees, the green grass! OMG…I love this time of the year and want to capture it ALL in photographs. 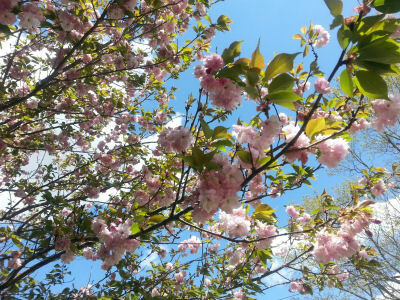 I think my favorite springtime trees are the cherry blossoms – both the white and the pink. We have a lot of those here, but it’s sad because they don’t last too long. 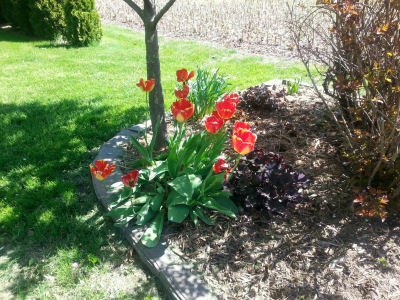 Thanks so much for sharing your beautiful spring in Central Illinois. Enjoyed! Aw, thanks for the encouragement, Ron! I know just what you mean — despite the allergies, spring is just such a HOPEFUL season, isn’t it? Everything bursting into life after a long winter’s slumber and all. I, too, love seeing pictures from around the world as to the changing seasons. I don’t imagine I’ll ever get to all the places where my blogging friends live, so photos are the next best thing! You still haven’t seen much spring yet, then?? Oh, dear, you’ll have to remedy that — and soon! 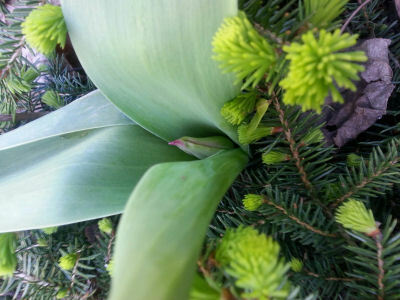 I love spring — and finding out which of the plants survived winter’s cruelty. Sad to see the ones which didn’t, of course, but that gives us a chance to plant something else– and start hoping all over again, ha! Just beautiful. I think your “cherry tree” might be flowering almond. The blossoms can range from dark pink to white, and the multi-petaled profusion is glorious. It was one of my favorite bushes/trees when I was a kid in Iowa. We’re all about rain, here. As in: flooding rain. The good news is that it seems to be spreading across the state a little more than in the past, and some of the people who’ve needed it so badly are getting some. More in the west would be good. 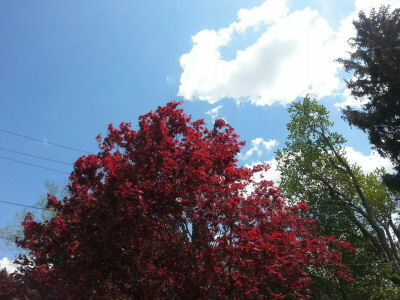 Enjoy your remaining spring — I never get tired of seeing the photos. A flowering almond, huh? Well, you absolutely could be right. I found them on a walk with Dallas, and neither of us knew for sure (and the homeowner wasn’t around to ask). Silly me, for making an assumption! Thanks for educating me — it is a beautiful specimen! I’ve heard about your rain. While I can’t help but feel sorry for your lack of sunshine, I suppose it’s a good thing to make up for the drought conditions you’ve been living through for too many years. We’ve had our share of rain as well. Two benefits are immediately apparent — pollen counts come down, and snakes stay hidden in their dens, ha!! How nice! Especially that cherry tree. I must needs get about 50 for my yard. I could see that. A cherry tree grove! 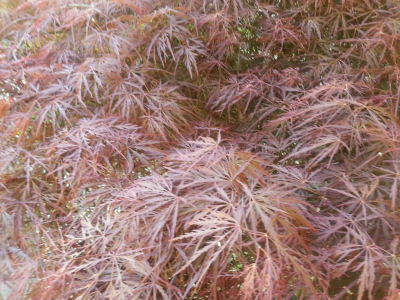 A grove of cherry trees would be spectacular, especially in the spring, Professor! And just think of how many milkshakes you could make when the fruit appears!! Oh boy! I’d make a hundred a day! 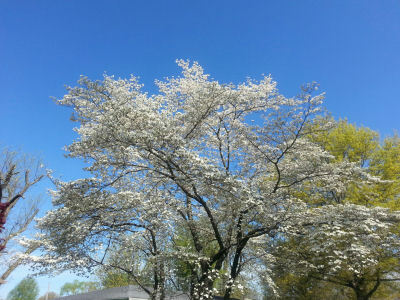 Ah, I miss Dogwoods… Beautiful. I particularly enjoy that second photo, Debbie. Gorgeous!! Just think…only a few short weeks ago we were grumbling about snow. I’m so glad you’ve found spring. Oh! And I love that you and John have connected, as well. He is such a cool man!! Awesome! I’m glad spring finally arrived, too. I love how NEW everything feels! Thank you for introducing me and John. He’s a super writer and a warm, caring man — ’tis great having another connection here! And it’s so cool that he’s a Domer, too!! I can hear the joy in your voice. Spring!Yay! You’re welcome, John is all of those qualities and so much more. You’ll see. :) Very cool! Gorgeous photos, Debbie. It’s even as colorful and Spring-like in the northeast, so appreciated in view of the winter we all had to endure. Thanks for sharing! Thank YOU, my friend, for stopping by to comment!! Yes, I’ve often thought those of us who have to endure a long and often brutal winter probably appreciate the arrival of spring much more than those living in more temperate climates!! Stay safe in those wicked storms, Kim!! Hugs from sticky Illinois!! Beautiful! We’re catching up…but still a little behind you. Finally, huh?? I just know it’s going to be beautiful there soon — y’all keep advertising the emerald green golf courses, the sandy dunes, the water, and I’m thinking it looks a bit like Paradise! I ALWAYS look forward to your beautiful spring and summer flower pictures! Lovely photos. You know I love flowers and nature’s beauty. Stellar! How sweet, Monica — thank you! Hope y’all have been able to get a bit of rain — pity you can’t buy some from Texas!! Stand more? Are you kidding? They are gorgeous! Is it possible to get tired of spring pics? I don’t think so :) Although, I’m so far behind, it’s well into summer now, haha!